The Albany Devils 2013-14 season has been nothing short of dramatic. After a scorching December stretch that saw the Devils get within six points of the division-leading Springfield Falcons the Devils have fallen drastically, especially in their last dozen games in which they have won just three. The Devils entered January having won seven of their last ten games and then faced the Falcons three times in five games. The Devils picked up one point in a 4-3 overtime home loss but fell 3-2 in regulation in their next battle against the Falcons. In their last meeting at Springfield the Devils pulled out a 3-0 victory, Scott Wedgewood’s first career AHL shutout. Since then, the Devils have a record of 6-7-0-3. In fact, the Devils have been a mediocre 9-10-2-4 since their franchise-record six game winning streak that ran from November 30 to December 14. In The Hockey Writers Albany Devils Season Preview, the prediction was clear: This season would be different. The last time a New Jersey Devils affiliated team made the postseason was when the Lowell Devils bowed out in the first round in 2010. In order to find the last time a New Jersey affiliated team based in Albany made the playoffs, one would have to go back over a decade to 2000. This season the postseason drought was predicted to end and a first round victory was also expected. As the Devils entered 2014 with a record of 19-8-2-2 and the fourth spot in the Eastern Conference with their depth still intact, the playoffs seemed imminent. As an added bonus, Mattias Tedenby cleared waivers to land in Albany. Then defenseman Adam Larsson was loaned to Albany. The two Swedes had an immediate impact and the Devils roster began to fill out again after a series of call-ups such as Eric Gelinas, Mike Sislo, and Reid Boucher began to return. Yet, the Devils watched as their seemingly secure lead vanished and now find themselves outside of the playoff picture by a point. 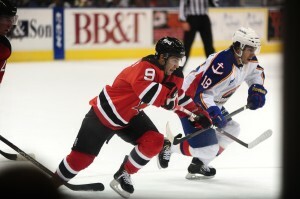 The Devils began to collapse after their January 18 victory at the Adirondack Phantoms, their fourth win in five games. The next night the Devils traveled to Hershey and looked poised to win their third in a row when captain Rod Pelley picked up his ninth goal of the season early in the third period to give the Devils a 3-1 lead. Midway through the frame, however, the Bears struck to bring Hersey within one goal when Ryan Potulny scored his first AHL goal of the season. With less than four minutes to play the Bears knotted the game with a goal from David Kolomatis, Hershey’s points leader among defensemen. The Devils eventually lost in the shootout 4-3. Following that devastating loss Albany would be off until the next weekend but the results got worse. The Devils fell to the Binghamton Senators twice, once in each city, and lost a close contest against the Phantoms 2-1 on the road. The Devils finally won again to close out the month with a 2-1 win over the Bridgeport Sound Tigers. Boucher and Tim Sestito each scored a goal in the game. Keith Kinkaid stopped 27 of 28 shots. The following night the Devils visited their rival, the Hartford Wolf Pack, and entered the third period with a 2-0 lead on goals by Sislo, his 13th of the campaign, and Harri Pesonen. Michael Haley scored early in the third for Hartford to cut the lead in half but Joe Whitney responded less than a minute later. Unfortunately for Albany, the memories of the Bears game would resurface and the Devils blew a 3-1 third period lead and would fall in the shootout once more. Back in Springfield on February 4 for the first time since their 3-0 victory, the Falcons returned the favor and blanked the Devils 4-0. Four days later the Devils faced the Sound Tigers again and won 3-0 on goals by Stefan Matteau, Kelly Zajac, and Chris McKelvie. Alexander Urbom added a pair of assists but the story of the game was Kinkaid’s late second period injury that would scratch him for the next four games. Wedgewood started the third period for the Devils and both goaltenders combined to make 28 saves. The next night the Devils were shut out for the second time in three games, this time by a final score of 3-0 to the Manchester Monarchs. With Kinkaid out day-to-day and Elmira Jackals net minder Maxime Clermont unavailable, Albany signed a familiar face last week. Ex-New Jersey backup Johan Hedberg returned to the organization by signing a professional tryout contract with Albany. Hedberg is not allowed to play with New Jersey this season because his contract was bought out by the Devils this past summer. As expected, he would serve as the Albany backup during their grueling weekend of three games in three different states. Johan Hedberg, nicknamed the “Moose,” returned to the Devils organization for three games (Rich Kane/Icon SMI). They opened the weekend with a Friday night shootout loss to the Bears 3-2 in Atlantic City, NJ despite winning the shot battle 35-23. This was Albany’s second loss in two games in Atlantic City this season. The following night the Devils played a true home game for the first time since January 31. In their final home game against the Phantoms while their rival is based at Glens Falls the Devils soundly defeated Adirondack 4-1. Chris VandeVelde opened the scoring for the Phantoms but the Devils responded with four straight goals. Sestito, Pelley, Tedenby, and Whitney found the back of the net for Albany and Wedgewood stopped 15 of 16 shots. However, fatigue would catch up to the A-Devils in their final game of the weekend. They outshot the Sound Tigers in Bridgeport 36-24 but a sloppy start that saw them fall behind 3-0 a little over thirteen minutes into the game was too difficult to overcome. The Devils were defeated 7-3. Hedberg got his first taste of the AHL since the 2003-04 season when he was a member of the Manitoba Moose by stopping 11 of 13 shots in almost two full periods of action. In the Devils past twelve games they have been outscored 37-26. They have also been shutout twice in that span. While the Devils only played in Albany a third of the time, and went 2-2 (not including their home loss in Atlantic City), their road record has been abysmal. In their seven away tilts they lost six games. The Devils power play has struggled as well with a 10.8% success rate. This is below their season average of 15.5%, 24th in the AHL. The Devils penalty kill has actually been playing very well. The Devils, 13th in the league in PK at 82.7%, have been killing opponents’ power plays off at a success rate of 86.5% in their last dozen contests. The Devils roster has gained strength despite the upward trend of defeats. Since the A-Devils January 19 defeat to the Bears, the parent club has returned Cam Janssen (in NJ since November 6), Boucher (in NJ since December 4), and Gelinas (disregarding two prior roster maneuvering call-ups, in NJ since October 23). Sislo returned on January 16 after playing in New Jersey for two weeks. Jon Merrill was returned to Albany on February 9 following New Jersey’s last game before the Olympic break but did not see any AHL action. He was called back up to New Jersey on February 19. Although the roster gained strength on paper, the results have not followed. Whitney, Albany’s leader in points this season with 42, has scored just three goals in his last eleven games in the AHL. Scott Timmins has just a goal and four assists in the Devils last twelve games. Sislo had four goals and two assists in his first seven games after being recalled but has been held off the score sheet in his last six games. Boucher, who had five goals and two assists in his last five games before making his NHL debut on December 4, is another top line Albany forward that has struggled. Since returning to Albany Boucher has scored just two goals and added four assists in eleven games. Tedenby has just one assist in five February games with a -5 +/- and a goal and three assists in his last ten games overall. On the defensive side Albany has also been battling. Larsson, their top player on defense, has five points in his last fifteen games and has a -5 rating. Raman Hrabarenka, who had three goals and seven assists with a +5 in December, was held without a point in January and finished with a -1. He has played just one game since January 26 but did score a pair of goals in that contest, the Devils 7-3 loss to Bridgeport on February 16. Dan Kelly has been mired in a horrific February funk. He entered February with 14 points and was +11. This month he has been held scoreless in seven games and dropped to a +5. The injury to Kinkaid was thankfully short lived and he will be returning to the Albany lineup. Kinkaid has 18 wins in 29 appearances this season with four shutouts, tied for second in the league. He is ninth in the AHL with a 2.30 GAA and has a save percentage of .914. With his return, Hedberg was released from the PTC. Gelinas will be eligible to return, as Pete Dougherty of the Albany Times Union reports, to the Albany lineup this weekend after missing the last four games because of the NHL Olympic break. The Albany lineup will return to full strength and the upcoming stretch of games will be vital for the slumping squad. The Devils will open this upcoming weekend with an hour drive north to face the Phantoms. Then on Saturday the Devils will begin a critical three-game home set before they set out on a five-game road trip. The home set includes two match-ups against teams they are battling for a playoff spot, the Norfolk Admirals and the Wilkes-Barre/Scranton Penguins. They are two points behind both teams. Those games sandwich the battle against their newest rival, the Utica Comets. During the Devils upcoming road trip, they have a chance to make a quick jump up the standings as they will face three teams below them in the standings (Worcester Sharks, Hartford Wolf Pack, Portland Pirates) and an important game against the Providence Bruins. They trail Providence by three points but have two games in hand. Following their road trip, the Devils will play ten (eight in Albany) of their final sixteen games at home where they have been a better team this season with a 14-8-2-1 record, as opposed to their road record of 12-9-1-4. The Devils must regain the confidence they had earlier in the season and get some scoring from their top players. Whitney, Timmins, and Boucher all played a vital role early in the season but have struggled mightily recently. The Devils schedule the rest of the way favors them with most of their games on home ice. With Kinkaid back between the pipes and the organization finally healthy in the NHL and the AHL, the A-Devils know the time is now to begin to secure a playoff spot. It has been far too long since an AHL team affiliated with New Jersey made the postseason and after their successful opening half of the season, the A-Devils can ill afford to let this golden opportunity slip through their gloves.